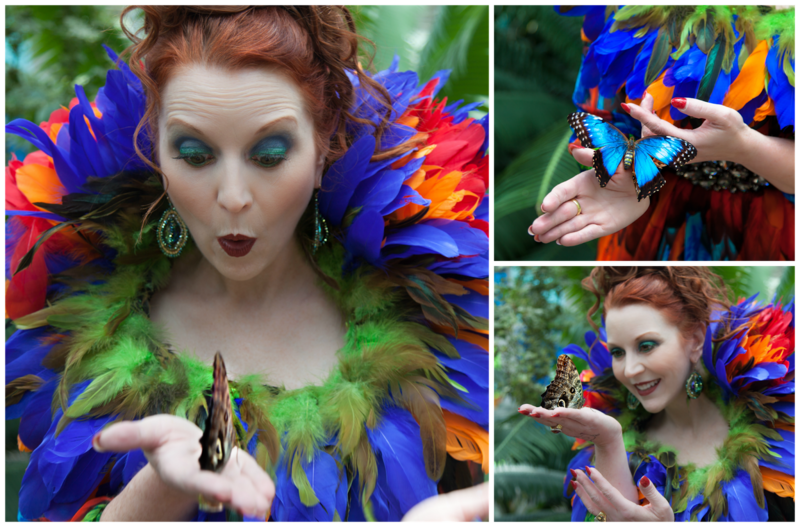 Getting up close and personal with exotic butterflies like this Blue Morpho, indigenous to South and Central America, made me feel a bit like Snow White. All photography by Faith Blackwell. I didn't learn about the birds and the bees at the Indianapolis Zoo, but I did learn about the birds and the butterflies! The Indianapolis Zoo's new "Magnificent Macaws" are a sight to behold, with three flocks that include multiple species and total more than 50 of the exotic birds. This "Paper Kite" butterfly was particularly fond of my parrot gown, and sat on my collar like a brooch for several minutes even though I was moving around. 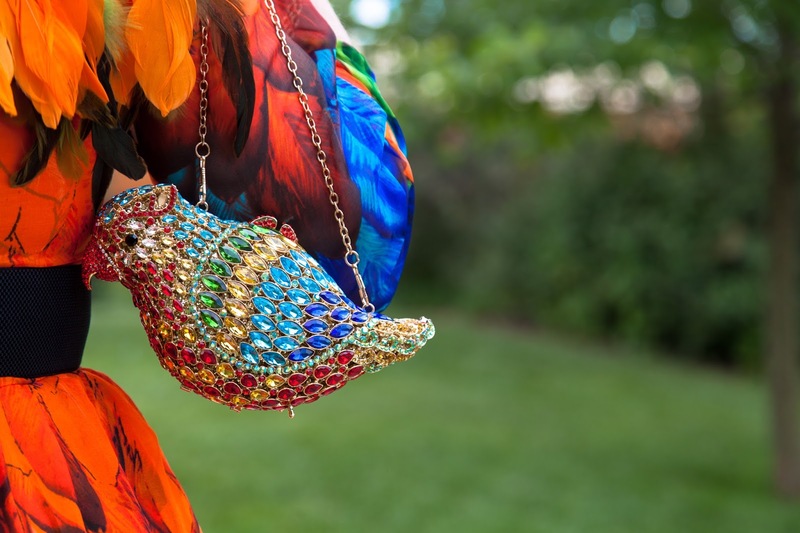 Last weekend, more than 5000 people feted these colorful winged creatures at Zoobilation, a black tie fundraiser that raises more than 2 million dollars to support the zoo's ecosystem, programs, and conservation initiatives. The "Great Owl" butterfly is so named for their owl-like markings. This little guy (or girl) crawled all over me. This was my 8th Zoobilation, which each year has a unique theme honoring one of the zoo's special exhibits. If you follow Red's Shoe Diaries even a little bit, you know that I love color, and that I can't resist a theme. 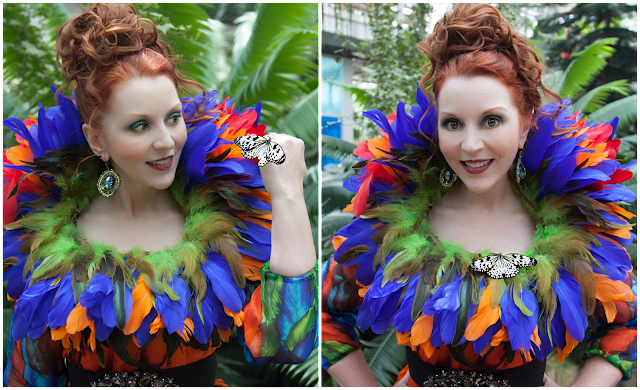 So, it shouldn't surprise you that I took advantage of the "tropical adventure" celebration of the macaws to indulge my imagination and dream up an over the top dress. It's not just kids who get excited about the zoo. 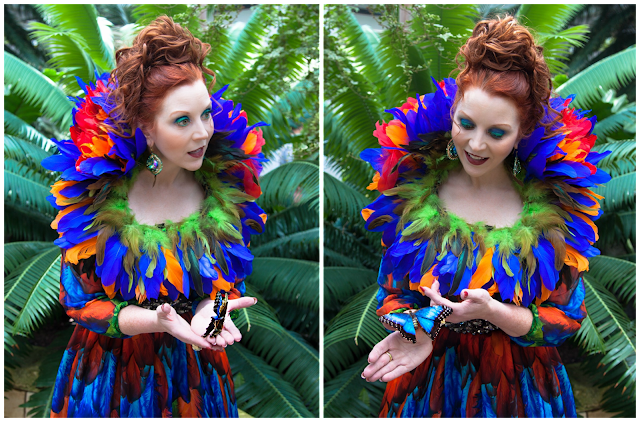 My butterfly experience was beyond cool, though they did tickle. I was also honored this year with a special opportunity to serve as the zoo's official social media fashion correspondent. 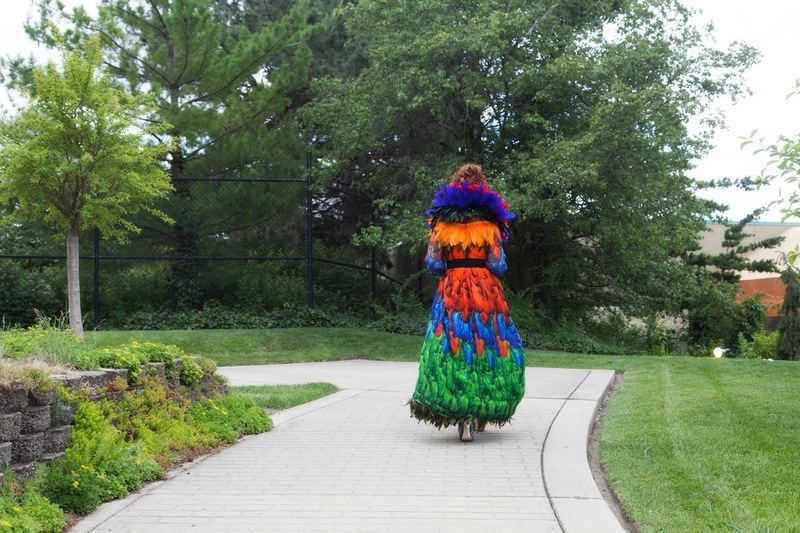 Guests really step up their wardrobe at Zoobilation, making people watching as engaging as watching the animals! You can check out my coverage of Zoobilation street style on Instagram. The Indianapolis Star, Where's Amy, and Pattern Magazine also had great coverage (see the links). Where's Waldo? Can you see the orange butterfly hiding in my feathers? Another one tried to hide out and hitch a ride on the back of my neck as I was leaving. One of the perks of serving on the zoo's social media street team was the chance to visit the zoo early to see the macaws in free flight through the zoo, which they do several times a day before landing in the new Bicentennial Pavilion where they preen and enjoy treats while zoo patron's get up close and personal. 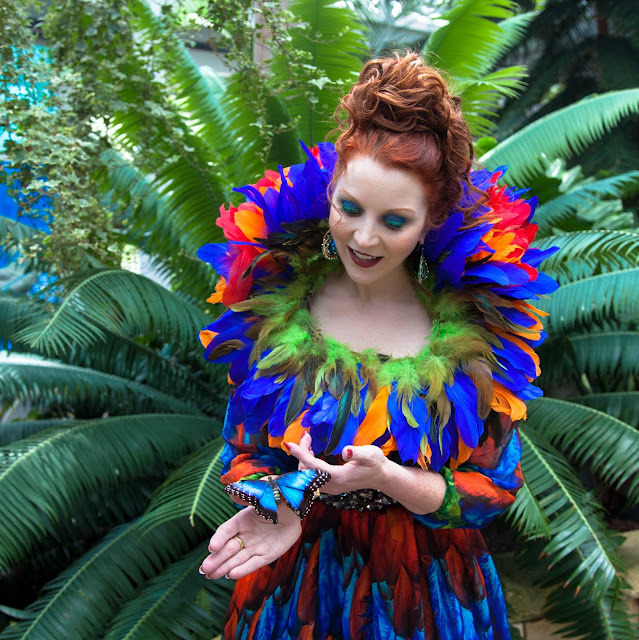 I wishI had crisp video of Blue Morpho opening and closing his winds in my hands. It's so vibrant and perfect it almost doesn't look real. Speaking of up close and personal, I was also a special guest of the senior butterfly keeper, who invited me into the White River Gardens butterfly habitat to "hold" several of the more than 30 different species of butterfly that live there, many of which I'd never even seen before. 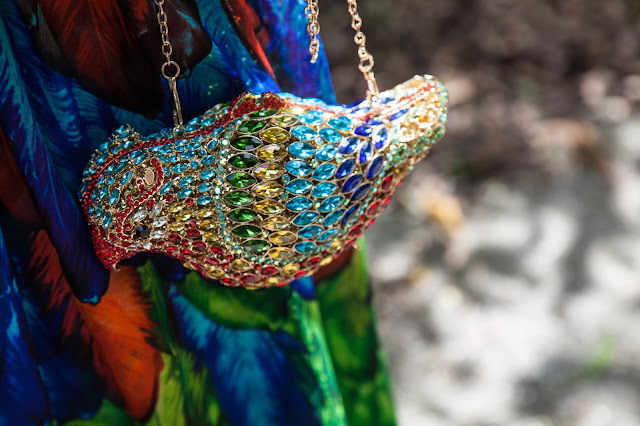 When you're going to an event celebrating some of nature's most colorful creatures, your accessories need to bright! 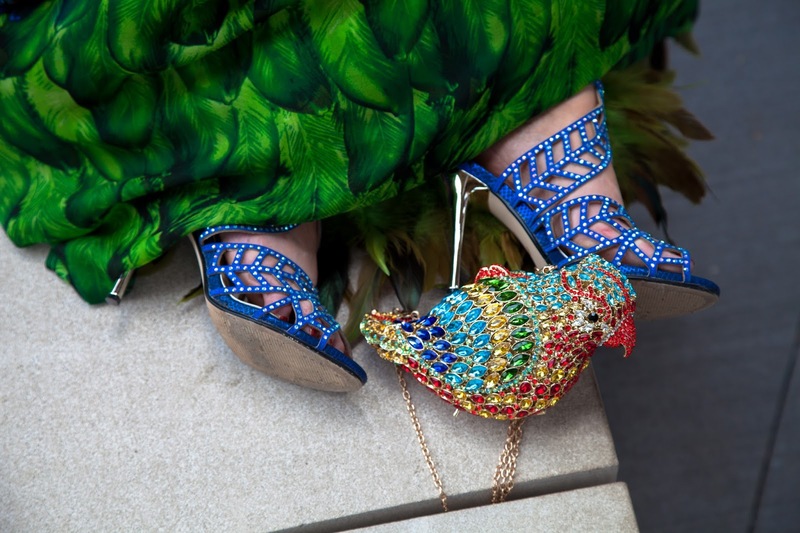 Both heels and purse are Amazon finds. You don't actually "hold" a butterfly, though, so much as you allow them to alight upon you and stay for as long as they'd like while you marvel at the striking colors and exquisite detail in their delicate wings. Zoobilation is outdoors and, though this year's weather was perfect, a little (matching) insurance never hurts. 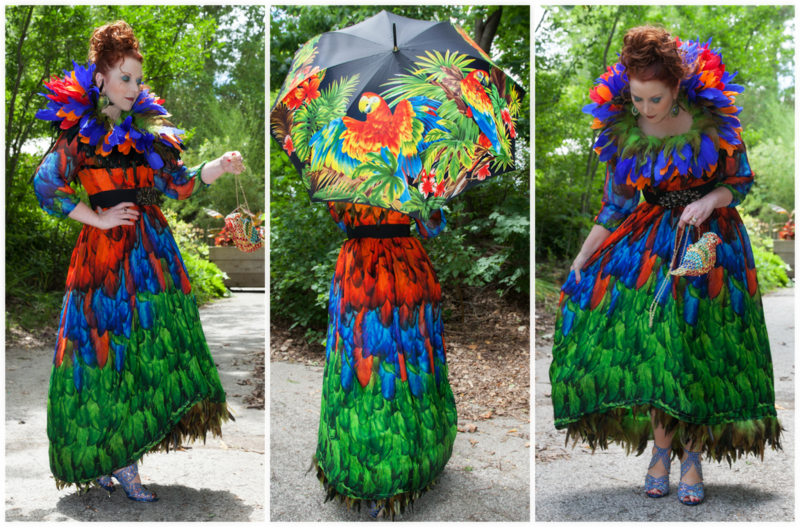 The parrot umbrella is also from Amazon. The butterflies were big fans of my macaw-inspired gown, and seemed very content to sit in my hands; crawl up my arms; and find a place to rest on my collar. 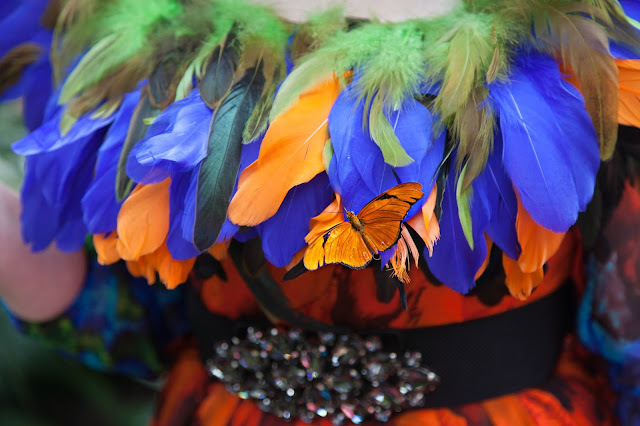 I think it was the bright colors of the silk fabric and feathers that attracted them, but having them flit around me and sit in my hands made me feel a bit like Snow White. 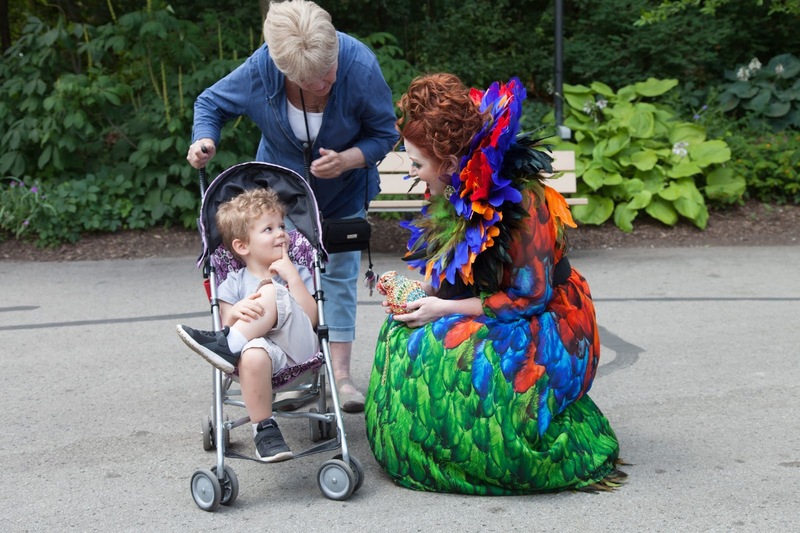 As it turns out, there were a few other guests at the zoo during my pre-Zoobilation visit who also thought I was channeling a fairy tale character, like the little guy in the photo below, who made my day with his shy smile afterI heard him tell his grandmother he though I was a princess. 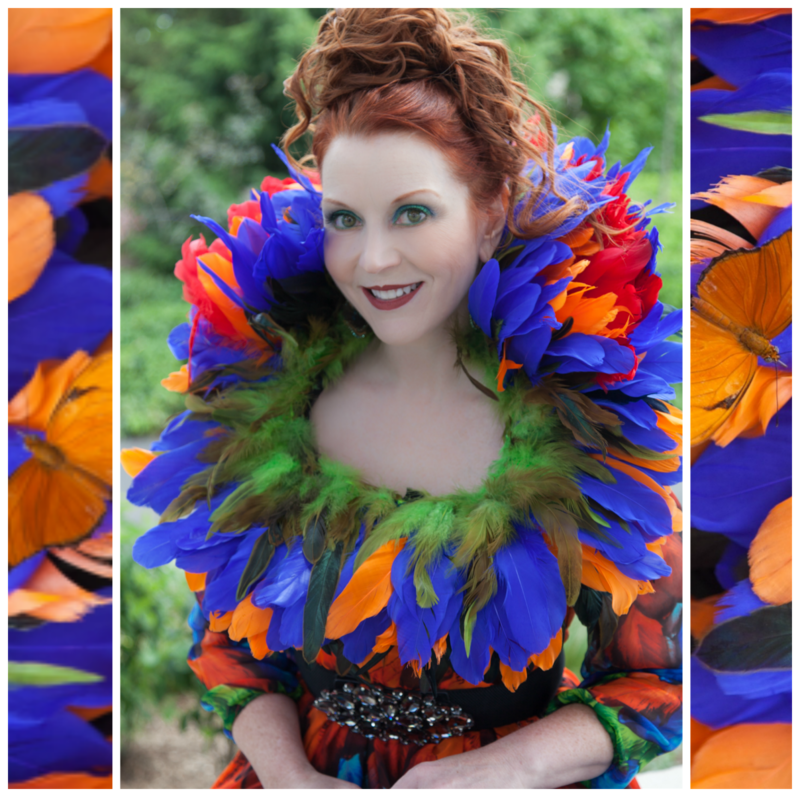 It was actually a Disney villain that helped me explain my vision for the collar of the dress to extraordinary local fashion designer Nikki Blaine - I told her I wanted it to channel Maleficent, but with color and feathers! 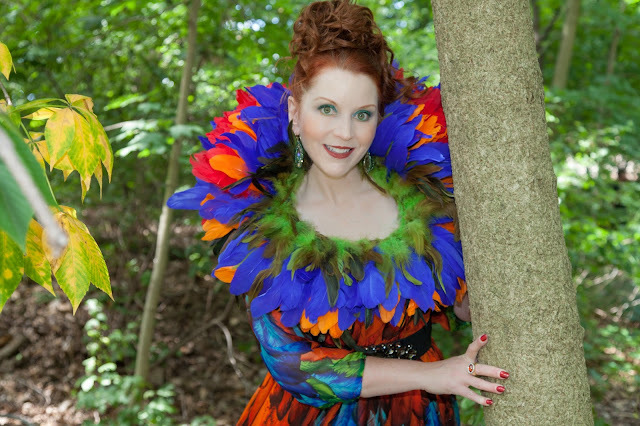 I knew the moment I found the sheer silk parrot feather fabric that it would make my perfect Zoobilation dress, but it took a lot of collaboration, patience, playtime, and serious sewing to turn the bolt of flowing fabric and pile of feathers I brought to Nikki Blaine's studio into the final, one of a kind creation. Nikki's creativity and skill not only brought my vision of a parrot gown to life, but also turned it into more than a one and done dress. The feather collar is separate from the rest of the dress, as is the feather-trimmed crinoline that peaks out from the high-low hem. 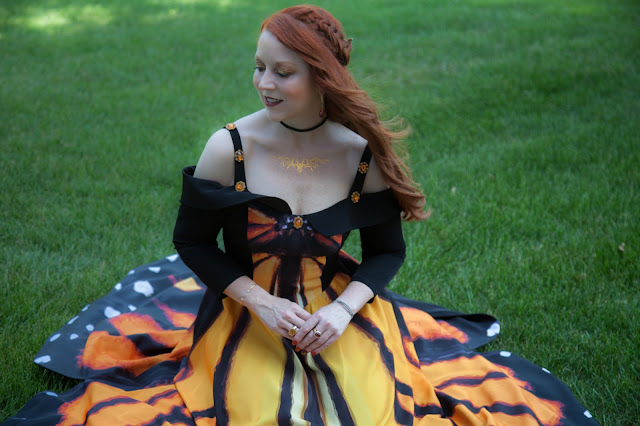 With the feathers and underskirt removed, I"m left with a beautifully lightweight and flowing silk maxi dress that can definitely be worn in a more casual Summertime setting or on a tropical vacation. 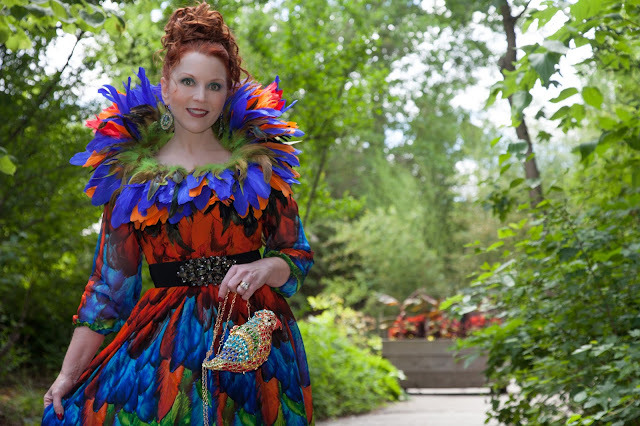 "Mac the Macaw," aka my purse, was the perfect accessory for Zoobilation, though just large enough to hold Altoids and a credit card, and is also a little work of art. He sits upright on little gold feet and his chain is removeable, making him a sparkling little sculpture to enjoy all the time! It truly did feel a little "magical." Thank you so much!! I'm so confused. 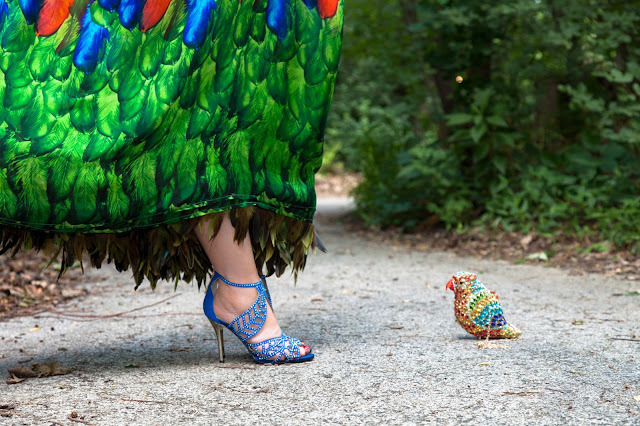 I thought I saw both of these dresses last year at Zoobilation. Did you loan one out or have I lost my mind? : - ) But, I remember both girls had red hair. I even took a picture of you in the blueish dress.